The following Bible Studies are meeting. Choose one or all that you will enjoy and fit your schedule. A list of the available Bible Studies and sign up sheets are available in the church narthex. This group will meet from 6:30-7:30 p.m. on the 2nd & 4th Wednesdays, beginning May 10th at Dietz Kitchen Gallery on Main Street. This will be a family Bible study, children are welcome. We will meet the 1st & 3rd Monday of the month. Meeting time is 5:30-6:30 p.m. at the Anderson home. A lawful “what we should do and how we should act,” coupled with a focus on Jesus’ love and forgiveness for our human shortcomings. We will be meet Baumgart residence. Contact the office for dates and times of the next meeting. 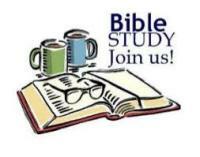 Please email stpetersreedsburg@gmail.com if you would like more information on bible studies in your area.